Creosote buildup is the natural result of burning wood in your fireplace. Creosote is caused by incomplete combustion. As wood burns it releases oily residues that build up inside the flue of the fireplace and on the fireplace brick. Creosote is a dark brown tar-like substance that can be several inches thick. It is not only unsightly, it is very dangerous as well. Creosote deposits are the primary cause of chimney fires. It is important to clean and inspect your chimney annually. Cleaning the creosote deposits and stains that build-up on the fireplace brick simply requires some elbow grease. Dust or vacuum the fireplace. Removing all the loose ashes makes cleaning the creosote and soot stains much easier. Clean the flue. The flue is that pipe that connects the fireplace to the chimney. Creosote builds up inside the flue and this is one of the most important areas to clean. Use a short chimney brush to scrub the inside of the flue. 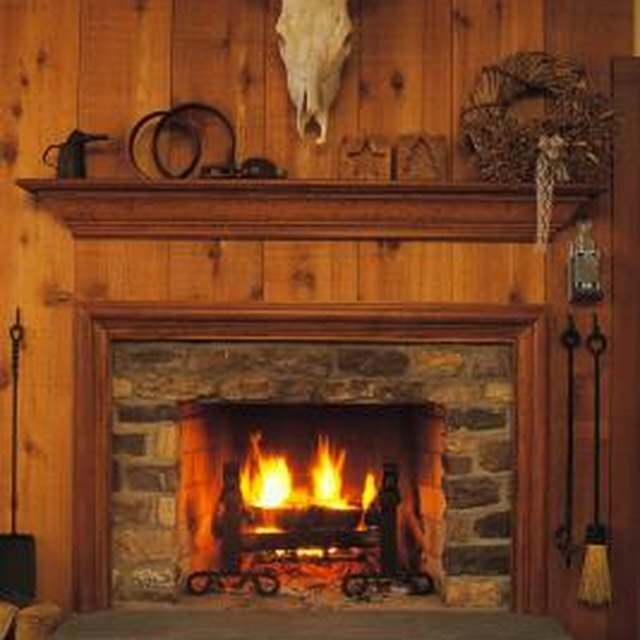 Scrub the damper and the fireplace hearth with a stiff brush. Creosote, soot and ash build up on the damper and hearth. Make a cleaning solution. Mix a thick solution of detergent, purnice, a pinch of ammonia and warm water in a bucket. An alternative cleaning is trisodium phosphate (TSP), which is an all-purpose cleaner. Mix a 1/2 cup of TSP with a gallon of warm water in a bucket. Apply the cleaner to bricks with a small brush. A small paint brush works very well for getting the cleaner into all the pores, nooks and crannies of the brick. Allow the cleaning solution to dry and sit on the bricks for an hour. Scrub the bricks with a scrub brush and warm water. This will remove the majority of the creosote. Repeat the process if the fireplace needs it.